After all, successfully embracing social media, especially Twitter, has proved a tricky and challenging project for football’s leading marketing men. A straightforward difficulty comes from the fact such institutions have no immediately clear product to sell through the channel. Although club Twitter accounts possess a guaranteed, fiercely loyal following even before they have been created – therefore making them the envy of the vast majority of other brands – their money-making potential is not immediately obvious to those concerned by a club’s finances. Furthermore, a poorly executed social campaign can have enormously negative effects on a club’s reputation and fanbase. “Our big concern is that if we get it wrong that fanbase will stop growing,” Rigby admitted. Inaccurate tweets can provoke viral criticisms of a brand or institution, whilst a premature release of sensitive information can have damaging effects on a club’s standing within various financial markets. Yet the decision to finally make the plunge onto Twitter will have been principally motivated by one very potent realisation: a well-run profile represents a highly influential outlet for totally free marketing. It was also rooted in the unavoidable realisation that a failure to effectively communicate with fans can have a serious impact on both the development of a club’s fanbase and the views that are promulgated across the vastly influential World Wide Web. Previously, United’s failure to engage their potential Twitter fan base saw the rise of several unofficial fan accounts, which inevitably encouraged the acceptance of potentially damaging negative opinions. In the 24 hours after Sir Alex Ferguson announced his retirement at the end of last season, for example, 1.75 million tweets were posted about the event. Control over an official channel capable of influencing the development of such stories can have a substantial influence on a club’s standing. 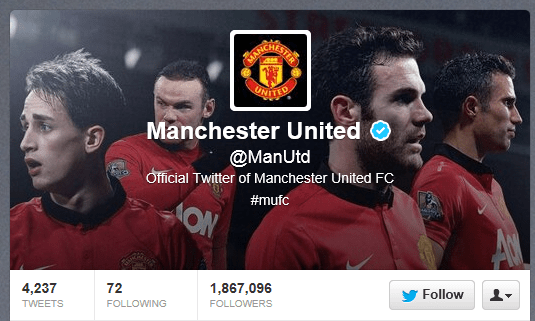 Since its establishment last July, @ManUtd has acquired over 1.8 million followers. Its development has been aided by the existing prominence on Twitter of some of the club’s most famous players, including Wayne Rooney and Rio Ferdinand. An #AskRio Q&A, for example, had an important impact on helping to raise the profile of the account in the first week after its establishment. The account has on the whole been warmly received by fans, consistently ranking highly in various engagement measurement tables. It places significant emphasis on images, in the form of infographics, artwork, behind-the-scenes photography and – increasingly – reasonably imaginative Vines. There is also a focus on interesting competitions and features detailing the club’s history. It is, of course, impossible to deliver an account capable of appealing entirely to the club’s vast cross-section of fans, making a prominent emphasis on visual aids a seemingly sensible approach to take. It also places only minor importance on developing its commercial interests, instead focusing on the long-game of encouraging the development of a healthy and prosperous brand identity. The account hit 1 million followers after 70 days in operation, a considerable but still slower growth that was expected, especially considering the ‘Manchester United’ brand’s worldwide reach and the 35 million Facebook fans the club boasted at the time. It still sits quite a distance behind the accounts of Liverpool, Chelsea and Arsenal; the most followed Premier League club with 3.4 million followers. Furthermore, despite whatever planning went into the account’s development, @ManUtd has been guilty of some embarrassingly amateur mistakes since its formation. Back in October it tweeted that the 1968 European Cup final against Benfica had finished 4-2 (the actual score was 4-1), whilst it has also been guilty of posting an incorrect Wayne Rooney goal tally and both the wrong date and opponent of Duncan Edwards’ England debut. A more consequential mishap occurred in May last year, when the club’s Facebook and press office Twitter account published announcements that David Moyes would be the club’s new manager before an official announcement had been made. The posts were deleted less than a minute later, but it was already far too late: the news spread to a vast audience across the internet immediately. 2014 continues to demonstrate the essential need of football clubs to maintain engaging and imaginative social media channels. Such outlets allow fans a new insight into events unfolding involving their team – their transfers, their game preparation, their matches – hence handing the club a heightened influence over the development of their identity within the online community. 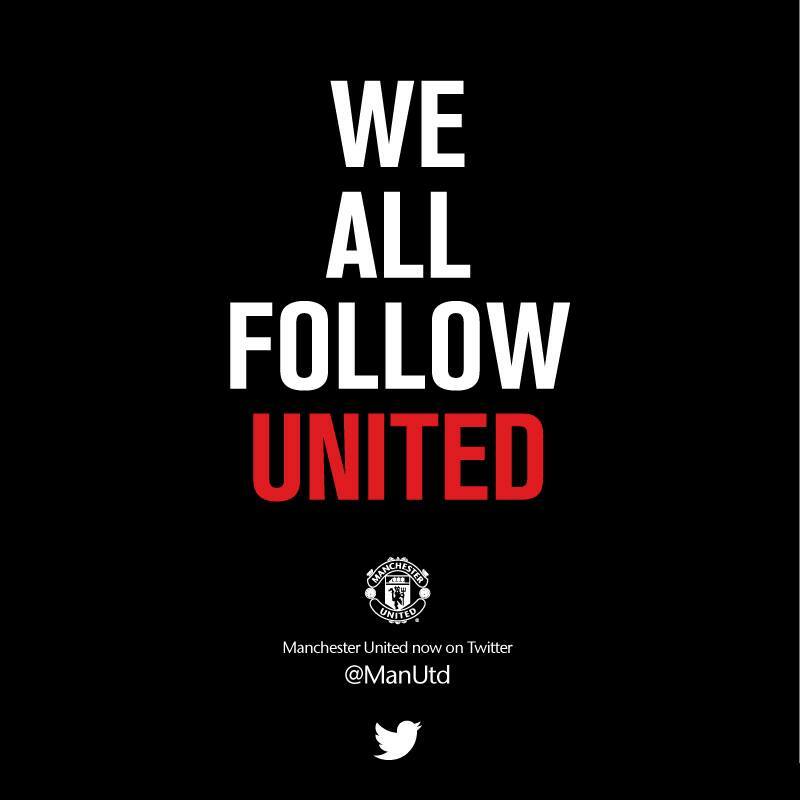 Manchester United’s official Twitter account is a more revealing demonstration of the benefits and potential pitfalls of social media than most. If nothing else, it proves that clubs must ensure they are continually developing their knowledge and expertise over this increasingly prominent marketing space. Piers is a marketing professional and DreamTeam blogger. Follow him on Twitter @piersbarber18. This entry was posted in Analysis and opinion and tagged david moyes, juan mata, man utd, manchester united, old trafford, social media, twitter by Piers Barber. Bookmark the permalink.